Intro: The Transdisciplinary Studio has been informed that there might be a strong possibility that next year our studio space might be moving…and it would be shared with another Program. So when this topic was announced, I was immediately intrigued and excited at the same time. Not only because the studio we currently call “home” really has failed to be a studio space, but because this subject closely relates to what I know very well – SPACE. So when our next assignment for Design-led Research (DLR) was handed to us, I knew immediately that I want to incorporate this topic into my next report with a continuation of my last report on Transdisciplinary collaboration – this time through workspaces. Thus, the design-led research process closely framed this topic as a way to collect inspiration for collaborative interventions for the new space. How might cultural probes contribute to a Trandisciplianary Designer’s research process that helps understand collaborative work space? 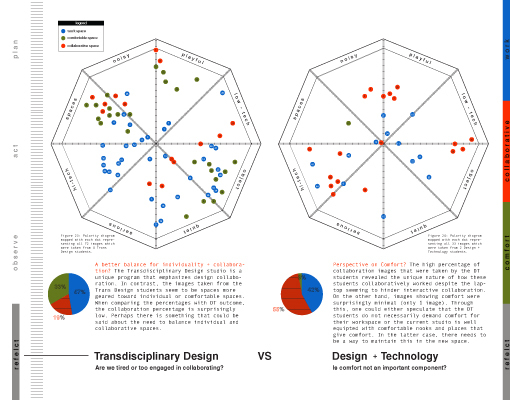 How might we design a Transdisciplinary Design Studio to foster collaboration with another program? Through this exercise various probe ideas were brainstormed and designed. The most compelling idea from each group was gathered. Eventually, from all the best ideas, the disposable camera emerged as the Probe best suited for the task for my research. It was a probe that could capture various work places allowing an understanding of each student’s working habits: individual, collaborative, color, texture, etc. Act: I initially hesitated to use the disposable camera as my probe because it seems to be the “traditional” way of probing. However, the reason I actually decided to go ahead and implement this ideas was because to really understand and experiment with cultural probes, I thought starting with the basics would probably be beneficial. Also, the simplicity of the camera and its lo-tech way of gather data appealed to me. Disposable Cameras: The intent of the designed disposable camera was to investigate the ways in which Transdisciplinary Design (TD) students and Design + Technology( DT)students worked (figure 7). How does each individual and group see comfortable space, collaborative space, etc. 4 students (2 male and 2 female) from Trans Design and 2 students (1 male and 1 female) from Design + Tech were given disposable cameras (figure 8 + 9). Each participant was asked to shoot 3 specific ways of working: workspace. comfortable space, and collaborative space. 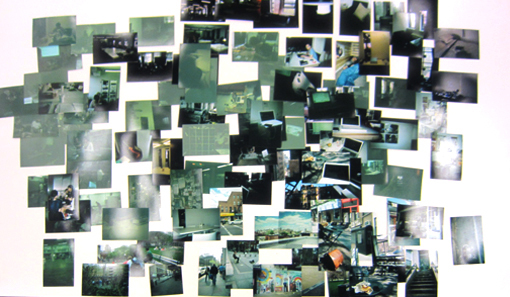 Each student was given 3 – 5 days to shoot 27 images of their work space. Observe: It was not until I saw the photos and really started engaging with the images that I realized Cultural Probes is not specifically about the media that you choose, but more about the inspiration and the clues that comes from the images that are taken by participants. It’s almost like being taken into the probee’s intimate daily life without a narrative. And the unexpected information speaks in a mysterious manner drawing you in. Reflect: Through the iterative process of investigating Transdiciplinary Design collaboration, my report eventually focused on the opportunistic abilities cultural probes can reveal to the process of Design-led Research. By framing my inquiry through my interest in collaborative spaces, I was able to contextualize my process and gather inspirational responses from participants. Similar to Ethnographic research (my first method deployed), Cultural Probes is a method that allows for a deep understanding of a specific demographic. This was the primary reason why I chose to deploy cultural probes for this phase of research. The intention of the probe was to investigate the ways in which Transdisciplinary Design and Design + Technology graduate students worked in spaces, individually or collectively, as well as level of comfort. The aim was to determine and reveal whether such differences and similarities existed in the two programs. During the observation process of the research, I experienced a strong sense of connection, empathy and understanding with some of the images. However, I struggled to make sense of the images into a report. Similar to the ethnographic research, the qualitative results that surfaced urged me to want to find a way of appropriating the Probes into a somewhat scientific way of representing the outcome as data. Was I trying to rationalize the Probes? It wasn’t that I was not unsatisfied with the playful, subjective approach of cultural probes. In fact, I truly appreciated how the method took me into an emotional and empathetic realm. However, when it came time to “show” as a report, a poster, or an artifact, I wanted to reveal an outcome that was compelling instead of just an inspirational gathering tool. Thus, the Cultural Probe had evolved into much more of an analytical design probe. This method revealed insightful patterns and clusters from the emergent data, ultimately taking form as the polarity map. One of the strongest qualities of a disposable camera was the quantity of data it allowed to produce in such a short period of time. As well, this data was ethnographically rich due to the non-verbal nature of photo documentation that avoids biases. Interestingly enough, the Probe revealed that the Transdisicplinary Design students need a balance of individual spaces as well as collaborative spaces for work. Ironically it revealed individuals preferred working in public places rather than at school. The unique qualitative patterns that emerged through the polarity maps allowed for a better analysis and more unbiased outcome.